White flowering Japanese wisteria. Common name: W. floribunda. HABIT: Fast-growing, twining vine that can grow to great heights. Purple spring flowers. has white flowers. 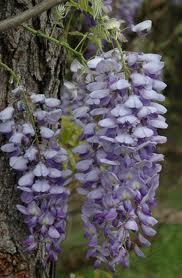 Japanese wisteria (W. floribunda) has longer flowers which don't open until the foliage is on the plant. Wisteria climbs clockwise. CULTURE: Loose, well-drained highly organic soil. Moderate water and fertilizer. Easy to grow in any soil. USES: Climbing evergreen vine for arbor, fence, or wall. Spring flowers. PROBLEMS: A few caterpillar attacks.Can take over if not pruned to keep in shape. Grasshoppers. NOTES: Most wisteria are native to China. Many gardeners have difficulty getting wisteria to bloom.